I have worked with teenagers now for over a decade. In that time, there have been significant changes in environment, social interaction, and educational expectations, but one thing has remained. Teenagers generally don’t feel they can talk to their parents. I’m coming from a place where I sit in groups with teenagers who are strangers to me and within 30 minutes of talking to them can get them to share who the most important person in their life is and why. I’m writing this not as the parent of a teen but as someone who works with teens, so this is also for any youth worker that wants their conversation to get better. I’m hopeful that this helps you, and I’m also hopeful it helps me as I start to create an environment for conversation with my elementary school kids that will carry into their teen years – because we all know if I wait, it’ll only get harder. In fact, today I was sitting in a group that has been meeting sporadically for about 12 weeks. One of the students brought up the difficulty she is having talking to her dad. There are lots of things involved with this situation, but I believe if her dad read these tips, he could learn so much more about his own daughter. With that in mind here are the tips I have found to be helpful, and I hope you can apply to your relationship with your teen as well. As a parent, it is difficult not to fill the silence. Resist this urge. In our training for group facilitators, we teach that counting to at least 10 (counting to 30 is better) when silence begins can help us wait long enough before assuming the other person is done talking. With kids, they are often just processing out loud, something most adults have decided needs to be internally. For them, it is normal to say out loud what they are thinking because they are trying it out. Let them. The fact is, they will become uncomfortable too and will likely say something else to fill the silence. Deciding at the beginning of a conversation this is about them, puts you in a position of listening rather then looking for what is wrong and correcting, or even worse, that there is a problem when none actually exists. Listen just to hear, listen to learn, listen to be able to repeat back. Make an intentional decision to not be thinking about how to answer or how to tell them what they should be thinking or doing instead. There is a stage of life for that, but it should mainly apply to kids under 9 years old. What bothered you about feeling that way? Have you ever thought that before? What do you think will happen if you do that? How do you think this might affect your future (or those around you)? These are just some ideas to get you thinking, but the point here is to ask open-ended, inviting questions without making assumptions or projecting your bias onto the student you are working with. Don’t correct unless safety is a concern. This is so hard because we as parents tend to think that this is our full time job, or maybe that’s just me. It is easy to feel that if we don’t correct or advise in a situation with a kid, we are depriving them of a learning opportunity or wasting a teachable moment. What if the teachable moment happened without us saying anything? As I mentioned above, at this age, kids are trying things out. Allowing this in a safe way actually helps them learn better. Simply decide to allow a whole conversation to happen without correcting, unless it is something dangerous. It will be hard, but do it. Decide to do this on a regular basis, but you have to realize how often that makes sense – once a week, twice a month, 5 days a week. Whatever it is, allow your conversation to be driven by your child or the teen you’re working with without any advice or correcting on your part (don’t worry too much, the odds of having the same conversation again are good). The value you will gain by doing this will open doors you never knew existed as they feel more comfortable sharing because they won’t feel so judged. One of the best things I have ever heard was a story about a father who told his kids that the old truck sitting out by the barn that didn’t run was a “safe zone.” It was the one place they could have conversations and tell him anything without any punishment. Consequences sometimes are unavoidable but he committed to no punishment. They knew that anytime they needed to tell something they feared they would be grounded for or worse, their cell phone would get taken away, they could tell him in that old truck. You can do this too. Declare a safe zone in or around your house. At our house, right now, it is simply that my kids can tell me, “I need to tell you something but I don’t want to get in trouble for it.” I have given them permission to share anything because I would rather be in the loop than be seen as the enemy when it comes to decisions that affect character and life lessons my kids experience. This is an extension of the listening tip. If you really are listening, you will hear opportunities to come back to and reassure them that you are there for them. A simple recognition of their interest or a question about a relationship they told you about can help them know that you truly care. This isn’t about you, so you can’t measure this based on how many times you think is enough. You have to keep reassuring until they tell you to stop or until that season has passed and it is no longer an issue. 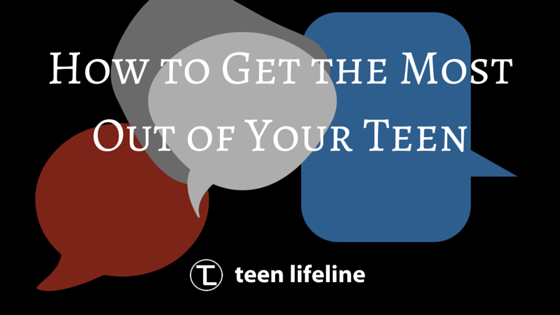 If you work with teens, knowing how to get more out of conversations is vital to their success. Maybe you have some better ideas. Take a minute to share them below. We love hearing from you and learning together.